Wow, only few more days and it;s Christmas once again. This year it will be very different for me since I will be celebrating it here in Australia for the first time. I know that Christmas here can be different from what I am accustomed back home but shopping is always not to be missed. Before even flying here in Sydney, I already had my Christmas shopping in Pinas that i brought them here. I had them wrapped just the other day and now they are sitting down at the Christmas tree while the kids are excited to see them. My sister and I had been busy buying gifts for her family too. We have been to a lot of shops looking for some Starwars stuff for her eldest son while some toys for her lil girl. Parents are busy shopping, all store are jam-packed looking for the perfect gift for their loved ones. MIDI controllers, musical stuff, toys and other items are being sold like hotcakes in some stores. I was given a 3-month Australian Visa last Nov. 14th after applying for a Family Sponsored Tourist Stream. I'm more than happy and thankful after I got the news. My sister just had an operation so she needed me back in Australia to support her and help around the house. I flew to Australia via Cebu Pacific on Nov. 22 and it's my Day 16th as of this writing. It was my 4th time to be here in Australia and I'm always excited to be here in Sydney. I had no problems with the immigration or during my flight. I just declared all the food and medicines that I bought and they didn't even bother to open my luggage which is good. We have been to many places already. My sister and I have been shopping here and there already and the only thing that bothers me is my size..lol Most of the women's clothes are size 8 and up and I could only fit on size 6 which is sometimes equivalent to XS.. yay so I just had few items bought. We have so many things and places to do around here in Sydney and I can't wait for more adventures. 1. Invest In Motivational Interviewing. As many psychologists know, motivational interviewing is a collaborative effort that involves a medical professional providing her or his client with the skills and encouragement necessary to promote internal motivation and a resolve to change. Motivational interviewing is an effective medical technique that many natural health practitioners now utilize to encourage clients who want to change their lifestyles in order to embrace holistic wellness. Doctors such as Dr. Bryan MD offer this service in conjunction with several other natural health techniques, including acupuncture and weight management. Click here to learn more about Dr. Bryan's medical practice and how he can assist you on your journey to outstanding health. Although juicing has become incredibly popular in the last ten years and is now viewed as a fad by many people, you shouldn't view it in this light. In fact, juicing is a very legitimate health practice that involves enabling people to flood their bodies with a steady stream of nutrients, vitamins, and minerals that help remove toxins, hydrate, and accelerate cellular removal. Juicers are relatively inexpensive, especially if you purchase a refurbished one. Moreover, juices can taste delicious even as they provide you with the nutrition that your body needs to detox and regenerate itself so that you can function optimally. It's no secret that many Americans don't get enough sleep. Unfortunately, a lack of sleep can have a plethora of unwanted health consequences, one of which includes overeating. The cure for a lack of sleep is simple: sleep. However, many people don't know what to do in order to break the cycle of insomnia or overworking that precludes them from rest. Luckily, there are numerous sleep techniques you can start implementing now to ensure that you attain all the rest you need and deserve. One great technique is meditation. Emptying your mind of the day's concerns helps get you into a mindful, rested state that can help you make a smooth transition into the world of sleep. If you're ready to get healthy and lead the amazing life you deserve to have, it's important to start implementing effective wellness strategies right now. To get started, be sure that you consider the value of motivational interviewing, juicing, and rest. Good luck! 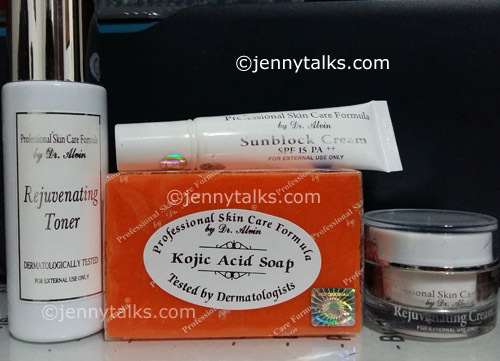 A friend of mine has been encouraging me to use this Rejuvenating Set by Dr. Alvin of Professional Skin Care Formula (PSCF) because she has used it. In fairness, now, she has glowing and almost flawless face. NOTE: BEWARE OF FAKES. ! Only buy at reputable sellers and dealers. The products must have seals and logos of PSCF. I will show you in details in photos. Seals and logo. Look for expiration date at the bottom of the bottles while on tubes and soap it is printed. Morning - Wash face and neck with Kojic Soap. Leave for about a minute or so (pero pag mag matagal mo na ginagamit sandali na lang kasi medyo mahapdi). - Apply Rejuvenating Toner on face. Let it dry. What I did was to put about 4 or 5 drops on cotton pads or balls then slightly wipe it on my face. Don;t rub too hard! ~ Apply sunblock especially when you go out. You can opt to use a sunblock with much higher SPF 40-50 since the sunblock that was included has only SPF 15. 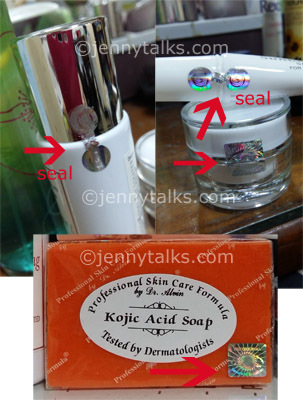 Night - Wash Face and Neck (don't forget) with Kojic. NOTE: Do not use if you are pregnant, lactating or if you're under 12 years old. If too much irritation or allergies, stop using it. Use the Rejuvenating toner for ONLY 30 DAYS! The 1st 2 Weeks are crucial, I mean "TIIS GANDA" talaga but at the end the pains are all worth it. DAY 1 (Sept. 27, 2015) - I started at night. Light stinging. DAY 4 - Woke up with an itchy chin. Face feels hot. 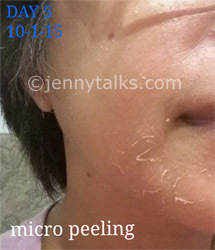 DAY 5 - Micro peeling already. Slight reddish face. - I stopped using the toner bec. it's a little uncomfortable for me na. DAY 8 - Itchiness on neck area.. Small rashes on neck area.. yay.. Bearable naman. - Shiny face bec. of the toner. DAY 11 - Woke up with a slight red patch on my lower right cheek. Face slightly mahapdi. -Medyo maantak ang neck area, sweating too on face bec. it's hot that day. To relieve the hotness and pain, I washed my face with water. - Dead skin washed off from my neck area. DAY 12 - Woke up with "maantak" face and chin area but bearable. More dead skin are washed off. DAY 13 - Woke up with a red scratch mark from my face probably due to rubbing of my face on my pillow or I accidentally scratch it when I'm asleep. DAY 15 - Skin smooth to touch especially after washing the face. Less shiny. DAY 16 - Acne marks on my chin are still visible. My niece noticed my nice skin.. naks! DAY 17 - Smooth but my T-zone is still oily. My blackheads became less. - Note: Be careful when wiping or touching face bec. your face is sensitive at this time. I had a few scratch my neck and face though. DAY 18 - I can let kojic soap stay on my face for about 1 min. now.. Less stinging. New acne appears on my chin area. DAY 19 - micro peeling on mouth area . Tight feeling after taking a bath. Parang binanat hehe. DAY 20 - same "tight"or dry face. Some areas are itchy. DAY 21 - new fresh acne on my chin area.. yay! ----- I STOPPED USING THE REJUV SET FOR 2 DAYS bec. I was at the hospital not because of using it but bec. of my vertigo . Anyway, I just resumed it afterwards. DAY 22 - more dead skin are being washed off.. Yey! Skin is clearer! DAY 25 - face feels dry. Peeling near mouth area. DAY 30 (Sept. 28, 2015) - Not all of my blackheads are removed. Acne marks on chin are less visible. Smoother face, glowing skin and clearer face. ~ The smell of the toner is not that strong. It's painful when applied (of course! ) that's when you know it's working. You can place an electric fan in front of you while applying or you can skip naman if you want if you think your skin can't take it any longer. ~ We all have different skin types so we'll experience different side effects. It's your own discretion if you want to continue or not when redness or rashes appears. ~Don't use any other product while under the treatment. I don''t use any even powder. ~Overall, the result was good on my face. My relatives saw the difference. They noticed that my skin looks "brighter" and fairer. Personally, I loved the effect on my skin. ~My skin face is not that bad to start with, I just wanted dead skin to peel off and made my skin softer and glowing and end result is ok naman. ~I can recommend this product to anyone with blemishes, dark spots and acne marks etc. ~I just bought CLARIFYING SET yesterday and will use it soon. Will do a review too once I'm done. I just wanted a maintenance set kasi sayang pag bumalik sa dati face ko.. but my aunt gave me this clarifying set. NOTE: This is NOT a sponsored post. I bought the product myself. 1. Determine Whether You Have Any Serious Health Issues. While an occasional cold or periodic headache are minor health issues that you can handle on your own, chronic illnesses and diseases need to be taken seriously. If you are experiencing symptoms which indicate that a serious condition is in place, it's a good idea to obtain rapid diagnostic tests which can tell you exactly which disease is wreaking havoc on your body and mind. Online companies like Diagnostic Automation/Cortez Diagnostics, Inc. are pleased to offer clients a wide range of testing kits. 2. Invest In Massage Therapy. 3. Make Daily Meditation A Must. Once you're ready to obtain optimal health, all you need to do is access and implement the strategies that will help you attain it. By determining whether you have any serious health issues, investing in massage therapy, and meditating regularly, you can start living at a level of wellness that makes life an extraordinary, beautiful experience! Many elderly adults are subject to abuse in their own homes, the home of relatives, and even the facilities that are responsible for their care such as nursing homes and day centers. If you suspect that an elderly relative, friend or neighbor is being physically or psychologically abused or is being financially preyed upon, it’s important that you speak up as soon as possible. This article will explain more about the signs of elder abuse and how to best prevent and report the issue. As older people become physically weaker and more frail, they are less able to stand up to being bullied or fight back and defend themselves if they are attacked. Because older people may be unable to see or hear as well as they once could, they leave openings for unscrupulous people to take advantage of them and their situation. Many seniors worldwide are subject to some kind of abuse, often by the people who are directly responsible for their care. In the U.S. alone there are half a million reports of elder abuse each year, with millions of further cases going unreported. In many cases of elder abuse, the signs and symptoms are unrecognized or not taken seriously at first. Many signs of abuse can appear as general signs of poor health, metal deterioration or dementia and signs of the elderly person’s frailty – and are often explained away by caregivers as such. In general, seniors who are being abused will tend to have frequent arguments or tension between them and their caregiver, and you may notice some personality or behavioral changes. If you suspect that an elderly person is being abused physically, you may notice one or more of the following signs. Look out for unexplained signs of injury such as bruises, cuts, and scars, especially if they appear symmetrically on each side of the body. Broken bones, dislocations and sprains could also signify abuse, as could any reports of a drug overdose on prescription medication. You should also look out for any signs of restraint, and be wary if the caregiver is reluctant to allow you to see the elder alone. Emotional abuse often goes hand in hand with other types of abuse, and if you witness a caregiver being threatening, belittling, or controlling towards an elder, this could indicate emotional abuse. The elder may also show behavior that mimics dementia such as rocking, mumbling, or sucking their thumb. Financial exploitation involves the theft and use of an elderly person’s money, and your elderly friend or relative may be being financially exploited if you notice any of the following. You should look out for significant withdrawals from their accounts, suspicious changes in wills, sudden changes in their financial condition and financial activity they could not have done, for example ATM withdrawals when they are bedridden. If you suspect that your elderly friend or relative is going through any of the above, contact elder abuse attorneys at Garcia Law today. Becoming the owner of a new boat can be a landmark occasion to be celebrated. While you are breaking out the champagne with friends and loved ones, you may also do well to celebrate the launch of your new vessel by purchasing items that you need to have on board. Whether you shop online yourself or create a sort of gift registry for your friends and relatives, you would do well to include items that are practical, as well as some for fun so that you can ensure that every voyage out to sea is enjoyable and safe. When you shop on the Internet, you may come across commission packages that contain a host of items that every good captain should have on board. For example, because you are responsible for the safety of your passengers, you will want to have gear that will keep them afloat literally in case your boat should capsize. You can find life jackets and buoys on the website that your passengers can use if you find yourself in water awaiting rescue. Likewise, this package also has a fire extinguisher in it so that you can put out fires on board your boat. You cannot use seawater to put out fires. In fact, the seawater can react with the blaze and make it worse. A fire extinguisher can effectively put out a fire and keep you, your passengers, and your boat from going down in flames. Other gear included in these kinds of packages include flares and safety kits for minor injuries. You can use the flares to signal to the rescuers your position. Other items like chargers and batteries can likewise be used to call for help if your phone or dashboard equipment needs powering. Along with commission packages, you can also find fun items to take on board, such as snacks and drinks that you and your passengers can enjoy while out on the water. If you plan on being out at sea for a few hours, you may want to a few snacks and drinks on hand to keep you satisfied. The website also has supplements that you can order so that you can bolster your immune system and make you ready to handle the elements while navigating your boat. Celebrating your new boat is easier and more fun with shopping online today. Last week, a typhoon which is named JENNY entered our country and thankfully it left not much destruction and raining our area. It was very first time that a typhoon is named after my name so I'm quite excited, even taking screenshots of the news or at social media. Sadly it lashed Taiwan badly. Anyway, a new storm just entered our country and it was now names KABAYAN. Yesterday it rained so hard that it left many areas flooded (as usual). With the continuous rains until early this morning, the weather bureau gave out list of signal warning to many areas including our place. Our municipality then declared that no classes in all levels today. That means my niece and nephew are at home doing their thing. My nephew loves computer games and music and I bet he'd be drowning himself with those today. I'm pretty sure if he will be able to browse http://musiciansfriend.com/, he'll then bug his parents for a guitar to practice as he he wants to learn to play it since summer. I just hope that he'll still open his books or notes to check on his school work but I know he'll do it on Saturday or Sunday. Meanwhile, my niece is on the computer poo. You Tube is her bestfriend, watching teen videos about her fave cartoon character My Little Pony at her age of 12..lol Kids will be busy all day for sure. An important part of running a successful business involves making upgrades and improvements to the building in which your company is located. If your store or office starts to show wear and tear, your customers may be less apt to visit your business and instead favor your competitors. However, another important part of running your company involves taking care of your finances and making sure that you avoid spending too much money on your building repairs. When you want to ensure that the contractor you hire is suited for the work and someone whom you can afford to hire, you can learn more about taking bids for any upcoming work by using the Internet. The website is designed to let you take bids from the comfort of your own home or office. You do not have to spend hours calling around to the various contractors in your area. You can instead search for contractors at your leisure and use a variety of search options to narrow your field from which to take bids. For example, if you want to know that the contractors you hire are local to your city, you can use the zip code search on the website. This option lets you find contractors who are within a few miles from your location. Likewise, if you want to find contractors who are within your state, you can click on your state's link. Choosing a contractor who is licensed in your city and state can be important when you want the work to begin right away. You want to avoid the delay that comes with contractors that must first obtain the licenses and permits to work legally in your area. This site allows you to network with companies that are already established and experienced in working with home and business owners in your area. Along with finding contractors ready to work in your city and state, you can also use this site to take bids for any project you have in mind. If you have a set budget that you must adhere to, you need to make sure that the company you hire will avoid going over that dollar amount. By taking bids on the website, you can budget accordingly and protect your company's profits. This site is designed to allow you to hire companies that can handle the work at a price you can afford. I hope you are having a great day today. I started my day with a smile and full of enthusiasm. It's always nice to greet the day with lots of cheers and I hope I can do that everyday. Music also plays an important role in my waking life. Almost everyday, I see to it that I can have my daily dose of music that can also inspire and relaxes me. Spotify is a gift.. really.! This is where I listen my fave songs and I can even browse all types of music on my desktop and mobile for free.. Yay! Listening is easy eventhough my speaker is not that big or hi-tech but let's me listen quite good. The boss 6 and other big musical accessories are needed anymore for my home listening pleasure. Just wish I have a more update speakers... hmmm... I will save for that and will give myself one on Christmas..yey! Right now, Jessie J's , Ariana Grande's Bang-Bang is playing and what a bang on my playlist. I'm so happy that God blessed me with the talent to create. As you all know, I have been making graphic designs particularly digital scrapbooking kit, digital templates, cliparts and more since 2006 and this year my products are in full swing. Since blogging has come to almost full stop, I'm so thankful that I still have other ways on how to enjoy what I do and still earn and that is graphic designing. I no by means an expert but I know I can create beautiful and usable background papers and more that anyone including crafters, teachers and more can use. Should You Invest in More than One Breast Pump? If you are having your first baby and you have decided to breast feed there are many things you need to know. The more you know ahead of time the better off you will be when it comes time to put your plan into action. If you have already nursed a child before then you know how important using a breast pump can be. New moms will want to take care of their babies every time they hear them even whimper…in the beginning. But after a while, mom needs a nap or she may need to step outside for a minute and get a little fresh air. How do you handle this when you are the sole source of nutrition for your baby? This is where a breast pump comes in. Even though you want to make sure your child is getting the most nutritious food source available it is possible to do both. When you use a breast pump, you pump the milk from your breasts into baby bottles that you will store in the refrigerator. The milk will only last about 24 hours, but that’s okay, you are planning on using them within that time period anyway. Now with a bottle already prepared and ready to go in the fridge, your spouse or grandmother can take the little one off your hands for a much-needed break. Baby still is enjoying your milk and getting to meet the other members of the family as well. Now there are different types of breast pumps – automatic, hand-held, battery-operated, electric, hospital-grade, manual, hands-free, and double breast pumps - see more here. First you need to decide which type of breast pump suits your needs. With the Affordable Care Act your health insurance company will pay for certain breastfeeding products and supplies. It will also pay for the rental of a hospital-grade breast pump if you would like to try it out first before you purchase one. If you are just going to use a pump sporadically you can get away with a manual pump. This is the least expensive of all the pumps and will take longer to gather the milk. If you are a busy mom who may be returning to work soon you may want to consider the hands-free and even double breast pumps. These pumps will draw the most milk in the shortest period of time, and usually do it hands-free. This does not mean that you have to stick to only one kind of breast pump. You may get one that is covered through your insurance and then pay for an additional one so you have a backup device in case you need it. The breast pump allows you to introduce your baby to a bottle so you will be able to add juice and water to his daily diet. Using a breast pump will give you the option to store milk quickly and have it ready when it is needed. Ever dealt with MKV files? Have you ever had to deal with this file type? Sometimes I wonder why the tech world confuses things and created a whole bunch of different formats to play a file when we can all just stick to one type of file. I miss the old days when any video you find can be played on any device. As you know I am a big fan of reality TV shows and recently I have found that a lot of my shows are available online in MKV format. As I expected, these files fail to play on my computer or tablet which is quite the bummer. I knew there had to be a solution as I noticed several users easily play these files. With a little bit of searching I managed to find Movavi which is an MKV file converter. I tried a bunch of different software and even online websites that claim to convert my MKV files to something that actually works but I haven’t had luck until I tried Movavi. If you are looking to watch your favorite TV show or movie and it’s in MKV format, here’s a simple guide to get it to work on your favorite device. • Once you open up the software you will find it is quite easy to use. If you are not the type to handle software that much it can be a challenge so let me guide you. • In the “Convert to” section you have to choose a video format. This can be a little tricky. Make sure you choose a file you identify. Generally, the mp4 file format is fine. If you would like to play your file on a portable device as well, Movavi gives you options to directly choose the file type based on your device. Choosing a file type compatible with a portable device will usually work on a desktop computer as well. • Next, you choose where to save the file. I usually save it on the desktop and then move it. • Once this is done, click “convert” and you are done! On researching this, I found that MKV is actually a great file format because it can save size but may not be the best option as it does not work with many players. Hot hot summer indeed! Summer is here in our part of the world and it's never been hotter. Imagine 30-34C temperature everyday coupled with humidity equals to sticky day. Anyway, summer vacation means a lot of time for kids to do a lot of summer activities that they will enjoy. Encourage your kids to do other stuff aside from playing games online ad with their gadgets/ It's healthier if they can also interact with other kids. Let them choose what they want like swimming, arts and craft, singing, dancing or even playing musical instruments where you can also get gig bags for guitars if they are hooked into it. Doing what they love will make them enjoy what they are doing rather than imposing them a certain activity that they will hate. Have fun and stay safe this summer. Closeout and overstock merchandise offers small business owners a good way to make a profit. These inexpensive items are still quality products, but they are usually reduced in order to move quickly due to certain circumstances that arise in the marketing world. Small businesses often buy closeout or overstock merchandise for their resale. If done properly, one can make a large profit from these items. The key is to buy merchandise customers desire such as products that didn’t sell due to economic reasons rather than being poorly made. The best items to purchase include store closing and bankruptcy inventory, seasonal items, obsolete merchandise, or returned goods. A good way to search for these deals is to use closeout dealers like BuyMerchant.com or area liquidators. Click here for additional information. There are two main benefits when it comes to purchasing closeout merchandise. It is inexpensive and high quality. The sale items are usually much cheaper through a closeout dealer than if you buy direct. Prices are often reduced for clearance in order to move the product fast. By taking advantage of overstock merchandise and closeouts from a reputable dealer, small business can turn a large profit. As long as they choose items for the right reasons and avoid poor quality products, these types of goods can help boost their sales by passing the savings on to their customers.